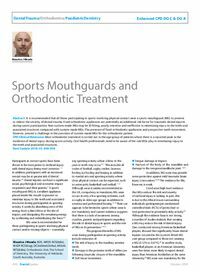 Abstract: It is recommended that all those participating in sports involving physical contact wear a sports mouthguard (MG) to prevent or reduce the severity of dental trauma. Fixed orthodontic appliances are potentially an additional risk factor for traumatic dental injuries during sports participation. Non-custom-made MGs may be ill-fitting, poorly retentive and ineffective in minimizing injury to the teeth and associated structures compared with custom-made MGs. The presence of fixed orthodontic appliances and prospective tooth movement, however, present a challenge in the provision of custom-made MGs for the orthodontic patient. Clinical relevance: Most orthodontic treatment is carried out in the age group of patients where there is a reported peak in the incidence of dental injury during sports activity. Oral health professionals need to be aware of the role MGs play in minimizing injury to the teeth and associated structures. Author notes: Maurice J Meade, BDS, MFDS RCS(Edin), MJDF RCS(Eng), DClinDent(Ortho), MOrth RCS(Edin), Orthodontic Unit, The School of Dentistry, The University of Adelaide, South Australia, Australia. Objective: To provide an overview of mouthguard (MG) characteristics, outline the orthodontic considerations of MG wear and describe MG fabrication for a patient wearing fixed orthodontic appliances.